Multi-Hotbar is a Minecraft Forge mod that extends Minecraft's hotbar past nine slots. The mod is open source and available on GitHub. If you have any issues, please report them there. 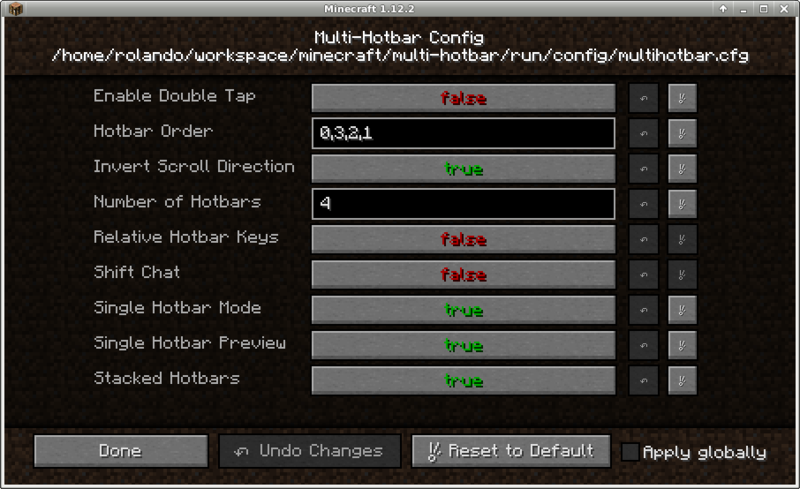 Note: Multi-Hotbar Core is required for version 4+. Vanilla server support is also dropped. Alpha: Not all features for the current release have been implemented and suggestions (preferably via GitHub issues) are welcomed. Beta: All features for the current release have been implemented. Report bugs to the Github issue tracker. Any feature suggestions will apply to the next alpha phase. Release: There are no planned features and no known or major bugs. Bugfixes will be applied. I do not quite understand. Multi-Hotbar and Multi-Hotbar Core - do they both need to be installed on the server and client? The core-mod needs to be installed on both the server and client. The frontend only needs to be installed on the client. Is it possible to have all 4 hotbars end to end? as in not stacked? That is not currently a feature. Obviously? That would be why I asked. The API makes it SO MUCH better! No more ugly bar shuffling! Completely compatible with custom Inventory Tweaks rules! They're now officially the best mod combo out there! But does it crash if you enable auto-refill in Inventory Tweaks? Dual Hotbar does, trying to find out if this does the same. This mod is extremely helpful when in building and design (creative mode). I like to build tons of stuff, and am also a huge fan of Noppes' work. If I am just out screwing around, killing mobs and such then it is less useful for me, although it is loaded anyway. With the hotbar addition in vanilla minecraft, which seems to me to be equally as useful, it would be nice if this somehow worked together. 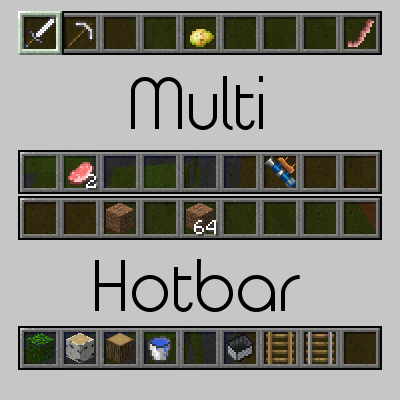 Currently, multihitbar's 2nd bar contains whatever is in your top row of inventory. You can switch between the two using whatever key is defasult (I change mine) or that you set up. This is cool and all, but if multihotbar could get along with vanilla it could be far more useful mod. make it so that you can set up the way vanilla is setup, and be able to scroll through those bars, but have the top row inventory bar still available. 1) Diamond Sword (for killing mobs that are in my way) 2) world edit wand, 3) custom npc wand, 4) command block, 5) anvil, 6) chest, 7) dirt, 8) grass 9) torches. So if you held this in the second tool bar, but could switch the first the way vanilla does, then you would always have your most common tools available all the time, and could change the first toolbar around however you want. Anyway, at this point I am torn between the vanilla and the mod since both, by themselves, are the best thing since journeymap and world edit to enhance game play. If they worked together they would be twice as powerful as they are now for use in creative mode. In fact, disabling multihotbar in any other mode would help keep survival and advernture mode from having too much power and control. Any way, its a suggestion, and some feedback. I have used multihotbarsince 1.10 in every world. I also use world edit, custom npc and varried commodities as my core mods for everything. Is there anyway to disable lines of items in your inventory moving around when you switch to another hotbar? The 4.0 beta does not rearrange items. Edit: I am not sure why reply #53 and #59 have moved to this thread. This is already a feature, fortunately. Holding left ALT (default) and scrolling or pressing a hotbar key (1-4 default) will change the hotbar. Would be nice if you could add a compatibility with the "Angel of Vengeance" (https://minecraft.curseforge.com/projects/angel-of-vengeance). The game don't crash, but when you active the spell bar, you can't choose a spell, the scroll wheel still binded to the hot bar switch. Both Multi-Hotbar and Angel of Vengence bind the left alt key. It can be changed in the controls menu. The problem is not the key binding on ALT, is the Scroll. It isn't possible to switch the skill as the scroll is always "binded" to change the current slot in the action bar/extra bars.